Figured this might be of interest to those who've been above 14,000 feet in California. Flickr albums linked at the bottom. In August 2018, I went to Colorado in order to conquer some of Colorado's 14ers (mountain summits higher than 14,000 feet). I had already climbed 3 of California’s 12 14ers (including climbing Mt Whitney twice), so wanted to see how I could do against Colorado’s 54 14ers. Some were definitely out of my reach, but others were actually pretty straightforward day hikes. I hoped to get a nice combination of pleasant day hikes to more challenging day and multi-day hikes. Variety is the spice of life, after all. Originally, my plan was to start off my Colorado 14er trip with a 4 day backpacking trek down in the San Juan Mountain Range. There’s an area called the Chicago Basin that gives access to three challenging 14ers and is supposedly a very nice area (although it sounds like it may have a few too many goats). It’s also one of the few places in Colorado that I found during my planning that had multiple 14ers and was far enough from roads to require a multi day backpacking trek. Sometimes it’s nice to get away from civilization entirely. But about a month before my trip, the narrow gauge train that would normally take backpackers to the Needleton trailhead was no longer offering that service due to track damage. That would mean at least an extra day and maybe 2 to hike in from the next closest trailhead, Purgatory Flats. Despite the ominously named trailhead, I decided I could extend this to a 5 day trek (and I always carry an extra day of food for my long treks, so that would cover a 6th day if needed). But as my day of departure from California drew near, the weather reports for the first week of my trip started to look pretty bad. The first two days might not be so bad for the hike into the Chicago Basin, but the next 2-3 days looked very stormy and this would be the days I’d be making my summit attempts. With success looking doubtful, I decided to move to the west and hit some of my targets in the Sawatch Range between weather fronts. The weather forecasts were looking a little better on that side of the Rockies. One nice thing about the Colorado wilderness is that there are rarely any permits needed or fees charged. This made changing my plans pretty easy to do. If this was the Sierra Nevada Mountains, you’d usually have to scramble for new permits when your plans changed. So with Monday looking like perfect weather, I raced across Nevada, Utah, and Colorado to Leadville, CO. Unfortunately, since it was dark during most of my drive through Colorado, I missed the views along I-70 which ran trough some picturesque canyons that the Colorado River flowed through (supposedly, since I didn’t see much of it). Monday morning I headed for a day hike of my first 14er: Mt Elbert at 14,433 feet. It’s the highest peak in Colorado and the second highest peak in the lower 48 states, right after Mt Whitney (14.505 feet). Starting with the highest peak that I could climb in Colorado wasn’t my original plan (although I had planned to climb Mt Elbert at some point during this trip) and I worried about my acclimatization time. Originally, I would have had a couple days to get used to elevations that varied between 10,000 to 12,000 feet on my hike into the Chicago Basin before I would have to go up above 14,000 feet. I started taking Diamox a couple days in advance to help me acclimatize and I spent most of the 2 days driving to Colorado between 4,000 and 10,000 feet (including sleeping in Leadville at 10,152 feet the night before). Hopefully, that would be enough. From the Mt Elbert trailhead, it’s a fairly easy hike up through a forest until you get to the tree line. That’s where the rocks and the first false summit appears. Fortunately, I was aware that it wasn’t the real summit and the first part of the trail through the rocks was in good condition, but gradually got steeper as you went. It’s a fairly long climb up a ridge line with great views as you went (although not views of the real summit itself). Then the rocky switchbacks started. I know they are a necessary evil when climbing up mountains, but my feet don’t listen to logic when they are forced to hike up switchbacks. And as I got higher and higher, the switchbacks got steeper and steeper. They also started becoming hard to find the ‘real’ switchback trail. Unfortunately, it looked like a lot of people had cut the switchbacks over time and there were sections where you just had to pick the best way up, trying not to fall or collide with other hikers. Since Mt Elbert is the highest peak in Colorado it gets a lot of foot traffic by experienced hikers and people who think it’s easy to climb a 14er because it’s has a trail. I’d have to say the last 2,000 feet of elevation gain was very strenuous, mostly rocky switchbacks that were barely there sometimes, and really deceptive (it seemed like there were at least 4 false summits along the way). But a lot of that could just be due the altitude and lack of oxygen making me crankier than normal. Even my PeakFinder app got tricked by a false summit. As I neared the final summit, it indicated the ridge above me was the true summit. It was wrong. 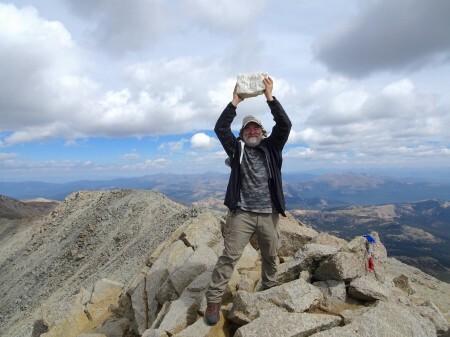 Fortunately, the real summit was very close after climbing above the final false summit, so my cursing faded into the thin air as I made my way to the true Mt Elbert summit at 14,433 feet!!! Plenty of people were at the summit when I arrived, so was pretty confident this wasn’t a false summit this time. My GPS and finding a benchmark both confirmed that I was actually at the real summit. I did double check that another bump in the ridge line nearby wasn’t the true summit (it looked a little higher from the true summit), but my GPS and my eyes confirmed it was a bit lower. Sometimes it can be hard to accurately judge elevation differences by eye alone. Thats why the ‘highest mountain peak’ designation changed quite often in the past (in Colorado and almost anywhere there are mountains). I didn’t find a summit register up at the top of Mt Elbert, but did find an elephant toy and a old pair of hiking boots. No signpost at the summit either, but everyone was passing around a ‘high quality’ cardboard sign for all the summit photos everyone takes (including myself). So after taking a LOT of photos, enjoying the view from the top, and taking a lot more pictures, I started my descent. Usually down is much easier, but the rough rock switchbacks made the first part of the decent almost as hard as the assent. Almost. But gravity is a hiker’s foe and savior, so it gradually helped speed me down the mountain ridge back towards the trail head… and pizza. I never had any altitude sickness symptoms on the trail, but did have a mild headache that night. A little Advil and sleep made that a non issue. Just a few more small headaches over the course of the next day, but no other symptoms for the rest of the trip. With my successful assent of Mt Elbert the day before, I had to decide what mountain to conquer next. With a thunderstorm forecast for later in the day, I decided it was time to play tourist. So while I didn’t climb it myself, it was a nice chance to recover from he previous day’s hike and also see some great views at the 14,110 foot summit. And buy some souvenirs at the gift shop at the summit. While they tout their ‘famous’ donuts, they didn’t particularly look that tasty so I passed on those. They also have an unique ‘cog railroad’ that takes people up to the summit as well, but it is closed for refurbishment and I only got a chance to see the rails at the end of the line. It’s a shame it was not running, since it would be a unique way to get to the summit. The fact that I got to the summit via Jeep and van didn’t stop me from taking a whole lot of photos. My digital photo sickness was in full force during this entire trip. As the shuttle dropped me back at the parking area at the Devil’s Playground, some ominous looking dark clouds moved in and I remembered the weather forecast. After taking some photos of that area, I started down the mountain in my Jeep. Slowly. You don’t race down a mountain like this, even in a car. They even had someone checking brake temperature to remind people to use a low gear instead of riding the brakes. My Jeep made it down unscathed, although my wits didn’t. On the way down I had a good reminder about why you do NOT want to be at the top of a tall, treeless mountain in a thunderstorm. The storm was pretty strong and I saw lightning bolts flash by pretty close to my Jeep. I’m glad I had the relative safety of my Jeep during the descent from Pikes Peak. With storms in the weather forecast for the next afternoon as well, I had to decide what 14er to climb next. I could have tried to do a early day hike up one of the 14ers that had short trails or played tourist for another day. Neither of those really appealed to me, so I decided I’d do a backpacking hike to get to someplace within range of 14ers that I could climb the next day (which was supposed to be clear and sunny) and that I could reach before the storms to setup my tent to avoid the rain. I decided the Missouri Gulch trail would work to put me in position to climb three 14ers: Missouri Mountain, Mt Oxford, and Mt Belford. These 14ers were in a part the Sawatch Range called the Collegiate Peaks. Most peaks in the area were named after famous colleges. Mt Harvard, Mt Yale, etc. You can push yourself to do all three of these peaks in a day hike, but the weather and my uncertainty if I could do that made me avoid that choice. I had actually found routes to these three peaks that involved approaching from the southern side and camping near a place call Little John’s Cabin. From there I could do a day loop of Missouri Mountain, Mt Oxford, and Mt Belford. With a bonus of doing a loop of Mt Harvard and Mt Columbia on another day. But upon further research, I was uncertain that would work for me. The approaches from Pine Creek were pretty steep and very challenging. Maybe if it was later in the trip, I would have tried, but with the changes on my schedule, Missouri Gulch looked like the safer route (I could always try a hike of Mt Harvard and Mt Columbia separately if I wanted). So the hike up Missouri gulch with a full 40 pound plus backpack was a challenge, but pleasant for the most part. But the rain came a little earlier than I had expected, so I did have to put my backpack’s rain cover on and slip into my rain jacket and pants. Fortunately, it wasn’t too long or heavy and I reached a area near the end of the tree line that would work for a campsite and allow me to sit out the rain that fell most of the rest of the afternoon and evening (with some short gaps to cook my dinner, stretch my legs, m and get some nice sunset pictures and movies). Finding a campsite was a little tricky. I had skipped on some well established campsites near the main tree line (one even had the remains of a old log cabin available for some ‘walls’ to pitch your tent inside (no roof). But I wanted to get close to the the junction of the Missouri Mountain trail and the trail to Mt Oxford. After finding the remains of a deer that had obviously been some predator’s dinner, I did find a decent spot. I just had to hope that I wouldn’t end up a skeleton stripped of meat like that deer. Just one of the many challenges of wilderness backpacking that can kill you. So I settled in for the night and got a decent amount of sleep… until the rain started at 5am the next morning. The bad weather was supposed to have cleared up the previous day and night, so being awoken by more rain on the top of my tent was an unwelcome way to wake up. As I waited for that to hopefully pass, I had breakfast and prepared my backpack for the day hike that I hoped was ahead of me. The skies started to clear after 6am and seemed to be headed in the right direction to start my hike (I still had my rain gear to use if needed), so I set off up the Missouri Mountain Trail hoping to summit at least Missouri Mountain that day and (if possible) all the other two 14ers in the area. After about about a mile and half, a hour of hiking, and a little over a thousand feet of elevation gained, the snow started. While I had my down jacket and rain layers with me to keep me wormer than some of the day hikers in shorts and light tops, it’s not particularly encouraging to have it snow at the start of a long hike. By the time I reached the junction of the Missouri Mountain and Elkhead Pass trails (maybe that skeleton was an elk, not a deer) the snow had stopped and the skies had somewhat cleared out. Unfortunately, there was a very strong wind blowing down the valley. While Missouri Mountain was the shortest of the three 14ers in the area, it had a steep class 2 ridge line to navigate. Doing that with the strong winds gave me serious doubts about being able to summit Missouri Mountain that day. Not only was it the hardest of the three 14ers in the area, the snow had somewhat dampened my enthusiasm to try and reach that summit. So with the late start from camp, the snow, and the strong wind blowing, I decided to skip Missouri Mountain’s 14,067 foot summit and continue to do a loop up to Elkhead Pass and the summit of Mt Oxford and Mt Belford before returning to camp. That had a higher likelihood of success and the added benefit that I pretty much had to complete the loop to get back to my camp or die trying. Motivation. The rest of the day had me climbing steadily up towards Mt Oxford up a fairly gentle ridge line. Then I saw the 500 foot drop I’d have to descend on the saddle between Mt Belford and Mt Oxford before climbing back up about the same distance to Mt Oxford’s summit. The good news is I pushed forward and successfully summited Mt Oxford at 14,153 feet!!! Great view from the top and I had the mountain all to myself since I had just passed a half dozen people returning from Mt Oxford. After enjoying the view from atop Mt Oxford, I made my way down and back up the saddle connecting Mt Oxford to Mt Belford. I was surprised to see Mt Belford had a very ‘castle like’ summit made up of a rocky formation. Mt Oxford had been more of a gentle dome shape. But this variety is what makes hiking so enjoyable. So I summited Mt Belford at 14,197 feet!!! Not that I had any choice since it was directly on the trail to get back to camp. More pictures made their way onto my digital camera’s SD card!! There was a summit register and pen here! So I made my first summit register entry of this trip, enjoyed the views and then started down towards my camp. From below the switchbacks crisscrossing the slope up to Mt Belford looked very annoying. They were only a little less annoying to descend down them. Nothing particularly steep or in bad condition about them, just a lot of them at the end of a long day. With the late start and snow, I think it was a good thing to skip Missouri Mountain for that day. Getting two 14ers done was very rewarding and I celebrated with a dehydrated 1 course dinner! Night came and I hoped the weather and my body would be up for another attempt at Missouri Mountain the next day. The next morning came without and rain and after breakfast I ran though my options and decided Missouri Mountain just wasn’t that high of a priority for me. Reluctantly, I broke camp and returned to the Missouri Gulch trail head. My Jeep had gotten quite dirty with the rain that had came though the area. But that was just the start of the dirt my Jeep would gather on this trip. My quickly put together plan was to go up the main Mt Massive trail to somewhere around the tree line and camp there for the night. Mostly a gentle, 3 mile climb up to that point and it would allow me a head start in the morning to reach the summit before the afternoon storms forecast for the next day could arrive (hopefully). After filling up on enough water for cooking dinner and breakfast plus what I’d need for the hike to the summit the next day at a the last stream before the summit, I reached the tree line and started to look for a patch of dirt to setup my tent. Some people like to camp further into the trees, but then you lose the view, so after a bit of searching in the sparse trees growing at the edge of the tree line I found a spot. Flat dirt patch just big enough for my tent, large bounder to use for gear and as a chair, stunning view of the Arkansas River Valley behind me and a even more stunning view of Mt Massive (and what I first thought was Mt Elbert, but it turned out to be a closer ridge that just looked similar) in front of me. Check, check, and check!!! So third night camping in the wilderness without a shower (but my nose typically stops working on day two of a backpacking trip anyway). Got some great sunset and sunrise photos and movies as a result of camping here, so overall it was a good choice. The next morning came and as I started the climb towards the summit of Mt Massive, I got several different views of the light of the sunrise over the mountains to the east and the light splashing across Mt Massive’s massive side. Very nice way to start a long hike. The first part of this part of the trail was fairly gentle with some nicely laid out switchbacks (apparently they had rebuilt this part of the trail recently, much to my feet’s delight) and a gentle climb up the east slopes. I played leap frog with several other hikers (day hikers and people who camped lower on trail from where I camped) throughout the morning. Unfortunately when I was an hour into my hike I discovered that I forgot my glasses in my tent. I’m not blind without them (or I probably wouldn’t have forgot them), but they do help with distance clarity. It was too far to turn back at that point, so would have to squint and hope my pictures filled in some of the fine details I may miss on the top of the mountain. Until I reached the saddle that joined the main summit with South Massive, the hike wasn’t that bad. I was glad that I had decided to do this hike with a overnight stop, it made it very pleasant and a single long day hike might not have been. Once on the saddle, the harder rocky part of the climb started. The trail was laid out nicely and was in good condition. I did have some confusion when I saw people hiking above me on a trail and I couldn’t figure out how the trail I was on got up that high and why they’d make the trail double back on itself so far. Turns out it was a trail down the north-west slope of Mt Massive. It’s a shorter trail, but supposedly more difficult. Although those hikers coming up that way said recent improvements on that trail made it easier than it once was. Maybe next time. 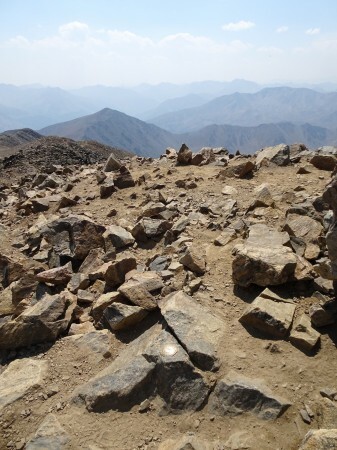 As I climbed over the rocky trail, I grew closer and closer to the false summit. Fortunately, I knew all about this one and expected it. It is also the only false summit along this route, so once I reached the top of it the real summit came into view and its was just a short traverse over to it without much of a dip in the elevation. With nothing better to do at that point , I finished the last couple hundred feet of the hike and set foot on Mt Massive’s 14,221 foot summit!!! What a view and what a feeling!! It’s always hard to describe the view, so I took a lot of photos. The feelings… to really understand you have to climb it yourself. Go for it!!! I didn’t find a signpost, benchmark, or summit log up there, but I did find a very unique summit marker: A small quartz boulder (or large quartz rock, depending on how you look at it) with the mountain’s name and altitude written on it! Now that alone was unique in itself, but when I looked around the summit and area surrounding it I couldn’t see any rock (large or small) like it anywhere. That meant someone must have carried that small bolder/large rock up to the summit at some point. As the pictures of me straining to keep it over my head show, it was a fairly heavy rock. Congrats to whoever did that feat! Mt Massive seemed to attract a wide variety of people. From a pair of young dudes who decided to get higher than the rest of us hikers (via smoking a certain herb) to a young child (probably, it was hard to tell) who apparently hiked up the maintain in a full ghillie suit, there were an interesting mix of people on this summit. So after exploring the summit, taking enough photos to line the trail back to the trailhead if I printed them out, and soaking in the grandeur of the mountains surrounding me, I had to make a decision: Mt Massive has 5 peaks above 14,000 feet. Only the main summit is an official 14er, so the sub-peaks wouldn’t add to my official total, but they were fairly close to the main summit. Green Massive, North Massive, and “Point 14,169” (cleaver name ) could be reached from the main summit with only a little pain and grumbling and South Massive that was near the trail back down to the trailhead. But with the weather report predicting rain and possible thunderstorms later that day, it would probably not be safe to attempt the three to the north of the main summit. As tempting as South Massive would be to tackle on the way down, I also couldn’t convince my body to climb up about 400-500 feet to get up to that summit. So I decided to enjoy the hike down. Before reaching my camp, the dark clouds started to close in and I realized I had made a good choice to start down when I did. I thought for a bit that I’d have to take shelter in my tent and wait out any rain, but besides a few drizzles on the way back to camp, I stayed dry. I broke camp and then headed for the trailhead. About a mile down the trail (it was about 3 miles back to the trailhead from my camp), I heard my first thunderclap. Did seem to be nearby and I was under the tree line, so I wasn’t too worried. I would be worried if I was still descending from the treeless upper trail. A mile later the rain started and there was more thunder. Never saw any actual lightning from where I was under the trees, but it was clear I got off the mountain just in time. Reaching the trail head I celebrated as I climbed into my Jeep, which was even more dirty by this point. Returning to Leadville, I had Mexican this time instead of pizza. Variety is the spice of life. Mt Massive wasn’t even on my main list of 14ers to climb during this trip, but with the reshuffling due to the weather and after seeing Mt Massive when I stayed in Leadville or drove down highway 24, it became irresistible to conquer this 14er. Like Mt Elbert, it drew people into it’s grandness. So after Massive, I (and my body and feet) needed a little break, so I went back to tourist mode and drove over to Mt Evans, which is the other 14er in Colorado with a paved road up it. One major difference to Pikes Peak is that Mt Evans isn’t as commercialized as Pikes Peak and is mostly USFS managed. Still have to pay a fee to drive up (although they call it a parking fee without providing enough parking spaces). So I let my Jeep do the hard work and made my way up, stopping along the way to see the views and take some pictures. Then I found a parking spot along the road right before the summit parking lot (which was full anyway). Lucky! Then the long climb from the parking lot to the actual summit began. Less than a thousand feet to hike with about 100 feet of elevation to climb. How horrible. The lack of a gift shop really made this a more enjoyable summit to me (although I did stop at the Echo Lake Lodge to get some swag on the way down). After checking out the actual summit, I went down to the ruins of the Crest House and looked around it. Kind of reminded me of Machu Picchu. Just smaller and at an higher elevation. I saw a mother and her baby goat walking around, as well. I had seen the reports of stormy weather that afternoon and headed over early to hopefully avoid it. Like Pikes Peak, I didn’t quite make it down the mountain before Mother Nature decided to punish me for driving to the top instead of hiking. Still…rain, snow, thunder, lightning, and now hail on this trip. Not sure what else Mother Nature could throw at me, but I was hoping NOT to find out. The hail and rain was short lived, so I took a meandering drive through the surrounding mountains before finding a hotel in Idaho Springs for the night (for those reading this that who are not in Colorado, Idaho Springs is in Colorado, not Idaho). The prior night, I decided that Huron Peak would be a good choice for the day. Even with the extra time it would take me to get from Idaho Springs to the trail head, I should have plenty of time to climb this 14er along the not too long class 1 trail. The biggest surprise that morning was that the storms that went though the area the previous afternoon and evening had deposited a blanket of snow (or hail) at the tops of the Swatch Range mountains. So my little hail storm on Mt Evans wasn’t an isolated event. After taking pictures of the white topped mountains, I made my way to the 4WD trail head for Huron Peak. The road to Winfield (an old mining town) was a decent gravel road, but from there the 4WD road to the trail head was a pretty rough and wild road. My Jeep Cherokee handled it fairly well, with only a couple scrapes heard from underneath. After starting the hike, I started feeling splashes of rain. It never got heavy, but as I looked around, the clouds were pretty dark and the wind was blowing fairly heavily. It seemed like the storms that had passed through the area weren’t quite done. Maybe I was looking for an excuse (or my body was), but I decided to abort. The late start and the threatening skies would mean I would be up on the mountain late into the afternoon and may end up in a thunderstorm. What I should have done is to put my tent up in one of the campsites lining the 4WD trail and relax a bit and see if he skies would clear up enough to try to climb Huron Peak later that morning or just wait till the next morning. But I decided to make my way back to Leadville and a real bed and more pizza. I think that was the real reason I aborted: My body just wasn’t up for the the hike that day. I did take the time to explore the old mining towns on the way back, at least. i.e. Tourist Mode. So that night I went over my options. The weather for the rest of the week was looking much better, so I had a lot of peaks to choose from. I considered trying to do the Chicago Basin trek, but I didn’t think I could mount that big of a trek at this point. It really was a trek that needed me well rested and eager to conquer new lands and peaks. After a week climbing 14ers, I could not pull the trigger on that plan. Hoping my body would cooperate the next day, I decided to try Huron Peak again. I did have to drive over that 4WD trail again. My jeep handled it fine again, but a red pickup truck didn’t. It had broken one of it’s front ball joints and was stuck in the middle of the road. Fortunately, it was at a point with enough clearance on the side to go around it. I don’t know if the driver hobbled their truck far enough ahead to a point where other vehicles could pass it, but that was a lucky spot for it since I and others could get around it. The driver was safe and getting assistance already, so I made my way to the trail head. I felt pretty good as I made my way up through the forrest around Huron Peak. The lower switchbacks were fairly good and then I emerged above the tree line into a wide open plateau. It was very picturesque. &#8232;And then I saw Huron Peak up close. Lots of loose rock and boulders all the way to the top. This might not be as easy as I thought. Then I saw a nice band of grass covered dirt leading up the east side of the mountain, criss crossed by switchbacks. Ah… that looked nicer. Without that, I’m sure this would have been at least a class 2 climb, if not class 3. So it was mostly an uneventful stroll up to the summit! At just a few feet over 14,000, it wasn’t the tallest 14er out there and was the shortest one I climbed during this trip, but it had great view from the top. Chatted with a couple other hikers for a bit, then had the summit to myself for a while. On my way down, I passed a group that I had passed much earlier. Fortunately, it looked like they had extra clothing to cover the shorts and light t-shirts some of them had been wearing at the start of the trail. I had my down jacket as usual, so remained toasty warm as I made my way down. As I left, the red truck was still on the trail (but the driver had left with someone), but I did pass a tow truck going the other way further down the road. It wasn’t going to be easy to pull that truck out of that 4WD road, but at least help was on the way. As I went over my options that night, I had a lot of single summits I could try and a couple hikes that I could get 2-3 summits conquered in a single day. Knowing my body may say ‘No more’ at any time, I decided to go for broke and do three 14ers in a single day. This day started with another fun 4WD road for my Jeep to lumber over (not as bad as the Huron Peak 4WD road, though), but when I arrived at the trailhead I saw a large bowl with a lake surrounded by mighty mountains, 3 of them 14ers. The rising sun had just started to illuminate the mountains to the west when I arrived and even the moon hung over the western mountains as if posing for a picture. I obliged it. The loop would take me up Mt Democrat on a class 2 trail, over to Mt Cameron, Mt Lincoln, and finally to Mt Bross before descending back to the trail head. Looked pretty easy from the trail head, especially that trail gently descending from Mt Bross. Cue foreboding music. Making my way up to Mt Democrat, the trail hit a section that looked like it was washed out. So I followed the other hikers in climbing up some rock rubble onto a small plateau. Not sure if I got off trail or if I followed the wrong people, but there was no path over the plateau that I could see. So I had to make my way to the other side where the trail obviously started up the switchbacks to the trail junction. Then it was a slow slog up towards the summit of Mt Democrat. Not the worst climb of the trip, but maybe I was just getting used to these by that point. Great views on the way up and spectacular views at the top! After enjoying the first summit of the day, I realized I had more to conquer. One interesting thing I found with this loop is that you could see the next summit from the previous summit, so once you conquered one summit you always had the next goal in sight. That provided some nice motivation. The trail doubled back on itself at this point and the big danger was that I could decide to return directly to the trail head instead of continuing on towards Mt Cameron. But I resisted that urge and started the climb towards Mt Cameron. A little easier than the climb to Mt Democrat and the summit of Mt Cameron was little more than a rounded bump that was at the intersection of the trails heading to Mt Lincoln and Mt Bross. 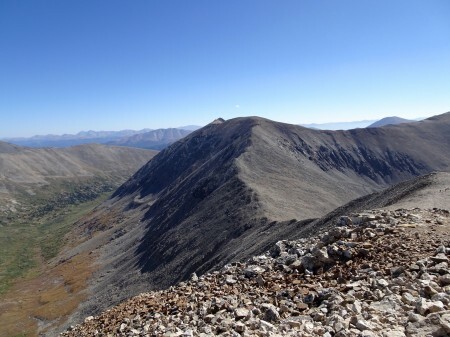 Even though Mt Cameron’s 14,238 foot summit was above 14,000 feet, it shared a saddle with Mt Lincoln (14,286 feet) and by the rules of 14ers (it needed at least 300 feet of prominence difference to be considered a separate peak) it wasn’t an official 14er. So I couldn’t count this as a conquered 14er, but it was a nice brief stop before heading towards Mt Lincoln, which was just a short hop away. Mt Lincoln was a nice peak sticking up by itself and you could really see the mining activity that covered the whole area. Some of the mines were actually still active, but somehow I didn’t find any gold or silver during my hikes. Honest, I didn’t. Of all the summits that day, I have to say Mt Lincoln was my favorite. It’s hard to say why, it just had that “I’m a mountain summit, come climb me” vibe. So after enjoying the top of Mt Lincoln, I made my way back past Mt Cameron and towards Mt Bross. This part of the trail was a pleasant dirt trail that just descended a little and then climbed at a nice gentle slope, so was a nice change from the rocky paths I had clambered over all day. Mt Bross was actually similar to Mt Cameron with a flat rounded summit. Then it was all easy sailing back down to my Jeep on that gently sloping trail I had seen from below. I think I took a wrong turn somewhere and went down a steep, scree covered slope. In my defense, it looked like most people had been taking it. Only after having to slide down the loose rock for most of slope did I notice a path with a much gentler slope that intersected the path I was taking. Ah well… such is life. After the last trifecta of 14ers I left open the possibility of another day or two of hiking in the Rockies or up to the summit of more Colorado 14ers, but a part of me knew that I was probably done for this trip. That part was my body, legs, feet, brain, etc… My hands were okay with more hiking, though. After a night of rest didn’t make my body any more eager to try another 14er or two, I decided to head back to California. I had thought about playing tourist up in Rocky Mountain National Park, but somehow that didn’t seem that exciting after the adventures I had already experienced in the prior two weeks and I had visited the national park in the past. Altogether I hiked about 60 miles during this trip. Pretty good milage, although unlike my last Yosemite and my Salkantay to Machu Picchu 60 mile treks these hikes were broken up by real beds and real food. Looking back on my trip, there was a good deal of haze over the mountains early in my trip. Unfortunately, the smoke from the California wildfires travelled wide and far. Fortunately, the rain and winds help clear it out so there wasn’t much smoke fueled haze to be seen by the time I climbed Mt Massive. I was also a little amazed at how high the vegetation line was in the Rockies. Many of the summits actually had small patches of grasses scattered around. In the Sierra Nevada Mountains it’s unusual to find much more than rock and more rock above 13,000 feet. But since I had seen small bushes and grasses up to and a little above 15,000 feet in Peru, I knew different climates lead to different vegetation patterns. I was also very grateful that I had no problems with mosquitoes or insects during this trip. Maybe a few flies every once in a long while, but I was pleasantly surprised not to have needed my insect repellent or head net. Maybe it was too late in the summer or maybe they just don’t have mosquitos in Colorado. &#8232;Except for the goats I saw on Pikes Peak and Mt Evans, the animals I saw were pretty similar to what I have encountered in the Sierra Nevada Mountains. There were a lot of marmots and voles at all elevations of the mountains I climbed. Saw some squirrels and deer as well, but usually at or below the tree lines. I did get to see the Colorado River gorge/canyons from I-70 in the daylight as I drove back to California, although I was amazed that they didn’t seem to have any scenic turnouts along the way (hence the lack of pictures). Maybe there wasn’t enough room, since it seemed like a major engineering achievement to fit 4 lanes of freeway into that narrow area that had a large river flowing through it. A little sightseeing in Utah and Nevada helped break up the boredom of those long desert roads. So in the end, I doubled my California 14er total during my 12 days in Colorado! A part of me looks back and know I could have done a little more, but it’s hard for me to feel anything but amazement at what I did manage to do. And there are 54 14ers in Colorado altogether, so I can always go back for the other 46! I’ll have to work on my California 14er count as well. It’s embarrassing that I haven’t done more in my own state. I had hoped to do at least 3 more California 14ers last year, but my plans changed during that Onion Valley to Mt Whitney trek. Next year. That brings back some great memories. I spent five vacations climbing the Colorado 14ers, many with my wife summiting too. 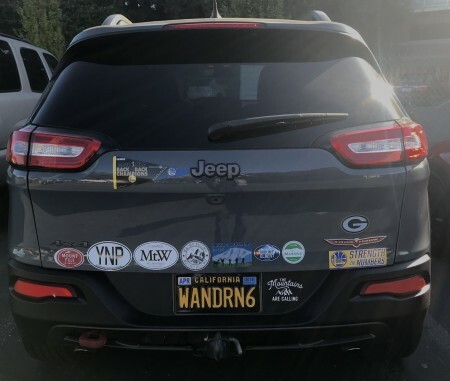 Great pics and awesome trip, Jim! Having just finished my third summer as Colorado resident (having moved from California), one of the things I love the most here is the amount of wilderness space we have, and the flexibility (due to lack of permitting) to explore it and change plans. Each summer at least one backpacking trip has gotten planned or changed last-minute, and we can always find some awesome quiet places to visit. The 14ers end up being uber popular with the weekend warrior crowd, but doing them mid-week, or getting off those trails completely, there is an abundance of beautiful places to explore. For future reference, the Elbert register isn't on the summit, but off to the side on the final approach. If I looked at the map, I could probably pinpoint the location. If I hadn't seen someone else signing it as I came up, I don't believe I would have found it last year, myself! Glad you had a great visit! Generated in 0.143 seconds in which 0.119 seconds were spent on a total of 14 queries. Zlib compression disabled.